You are a duel fuel system. To view excellent videos on this topic, see the bottom of the page. Humans can run their metabolism in two ways. Like a car that can run on gas or run on electricity, your metabolic system can be in a glucose-burning mode or in a ketone/fat-burning mode. When glucose is around in more than minimal amounts, the body will be in a glucose-burning mode. Some people will argue that means the body “prefers” to use glucose. Some will say that, since high blood sugar is quite toxic, the body makes a priority of dealing with incoming glucose. The glucose from your digestive tract goes first to the liver. From there, some goes into the blood stream to be used by all the other body tissues, some is stored in the liver in long chains called glycogen and some is rapidly converted in the liver into fat, which then goes into the blood stream or can remain in the liver. The level of sugar in the blood stream is very actively managed. When you think about glucose and blood sugar, you might think mostly about sweets and sugar in your diet. For most people, though, the major source of glucose coming into the body is starch. Starch is long chains of glucose molecules strung together. In the digestive tract, enzymes break apart the single glucose molecules from the long chains. Thus, when you eat a bun or cereal or pasta or rice or beans, the starch in these foods becomes a flow of glucose coming from your intestines and entering your liver. When the very little carbohydrates are coming into the body, there is another fuel system you can switch to. First, the body makes use of the glucose that has been stored as glycogen, which is long chains of glucose molecules – basically the human version of starch. When this supply is getting low, the body can start burning fat more readily and releasing and burning small molecules called ketones. The ketones can then be burned for energy in a way that markedly reduces the use of glucose for fuel. The wonderful advantage of having this ability to run our metabolism “in ketosis” is that it saves us from rapidly breaking down our muscles when food is absent or in short supply (starvation) or when there is a low supply of carbohydrates in the diet (think the Arctic in winter or the Ice Ages). Without being able to swap ketones for glucose for some of our needs, we would have to make glucose by first breaking down protein from our muscles and internal organs. In starvation, we still do break down muscle tissue for some glucose that we just have to have, but much less muscle tissue per day than if we couldn’t make and use a good supply of ketones. If there is a good supply of protein in the diet, the muscle breakdown does not happen at all, because some of the dietary protein is converted to glucose. Some glucose also comes from burning fat for energy. It turns out that there are a number of reasons why a person might actually find it beneficial to choose to be “in ketosis” even if there is a plentiful supply of various foods. Actually, some people might find it useful to be in ketosis because there is an ample supply of a wide variety of foods around (and processed food-like ingestibles). There are many health benefits of this innate system of dietary ketosis (also known as nutritional ketosis or therapeutic ketosis or being on a ketogenic diet). These terms are used to indicate that the person is in ketosis due to the diet (or lack of diet) that the person has. These benefits would be more widely known and therapeutic ketosis would be in commonplace use if not for an unfortunate confusion about the term “ketosis”. There is a serious medical condition called “ketoacidosis” where the ketone levels become very high – so high that the blood becomes acidic. This is a medical crisis and can be fatal. Most cases occur in people with insulin-dependent diabetes, and are precipitated by dehydration and high glucose in the presence of inadequate insulin. I’m a doctor, so I always say the cautious bits: as with all medical interventions or diet choices, there are some conditions where the use of a ketogenic diet would not be advisable. Some medications may need to be changed or the doses reduced under attentive care and monitoring. There are some genetic conditions which would mean that a ketogenic diet would be harmful or poorly tolerated – such as the recently described “Arctic” gene. Young children can become nauseated if they are subjected to prolonged fasting or sudden introduction of a strict ketogenic diet. With the nausea, they may intake too little fluids or vomit and become dehydrated, which may push them into high levels of ketosis requiring immediate medical care. In sum, as with any and all health measures, people are highly variable and this must always be kept in mind. There are no average people. That said, for the vast majority people, nutritional ketosis is a healthy and normal state to be in from time to time or over periods of time. Special attention is required to be sure that good general nutrition is kept up. The term that is used is “a well-designed ketogenic diet” – to refer to the fact that all the other nutritional facts of life still apply. There is a lot on the internet about nutritional ketosis and ketogenic diets. Much of it is useful, much of it is mis-leading or just plain wrong. There is excellent information in the presentations below. Presenter: one of the world’s top experts on the topic of ketogenic diets: Jeff S. Volek, PhD, RD, Professor, Department of Kinesiology, University of Connecticut. Presenter: Dr. Stephen Phinney MD, who is one of the top experts in the clinical use of ketogenic and carb-reduced diets. Very-low-carbohydrate diets or ketogenic diets have been in use since the 1920s as a therapy for epilepsy and can, in some cases, completely remove the need for medication. From the 1960s onwards they have become widely known as one of the most common methods for obesity treatment. Recent work over the last decade or so has provided evidence of the therapeutic potential of ketogenic diets in many pathological conditions, such as diabetes, polycystic ovary syndrome, acne, neurological diseases, cancer and the amelioration of respiratory and cardiovascular disease risk factors. The possibility that modifying food intake can be useful for reducing or eliminating pharmaceutical methods of treatment, which are often lifelong with significant side effects, calls for serious investigation. 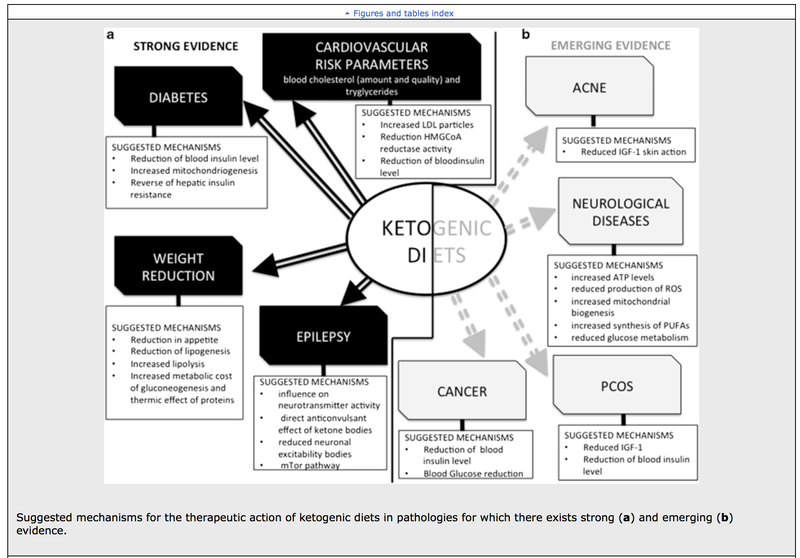 This review revisits the meaning of physiological ketosis in the light of this evidence and considers possible mechanisms for the therapeutic actions of the ketogenic diet on different diseases. The present review also questions whether there are still some preconceived ideas about ketogenic diets, which may be presenting unnecessary barriers to their use as therapeutic tools in the physician’s hand.